When it comes to bedrooms, stuffing lot of stuff doesn’t work for everyone, as for some less is more whether its summers or winters. Pulling off a simple and minimally designed interior, however, is not as easy as it may sound because when poorly done it can ruin the sophistication and rich look of the layout. Bed is the focal point of any room because it’s the first thing that catches your eye as soon as you step in the space. So let’s begin with the bedding first. 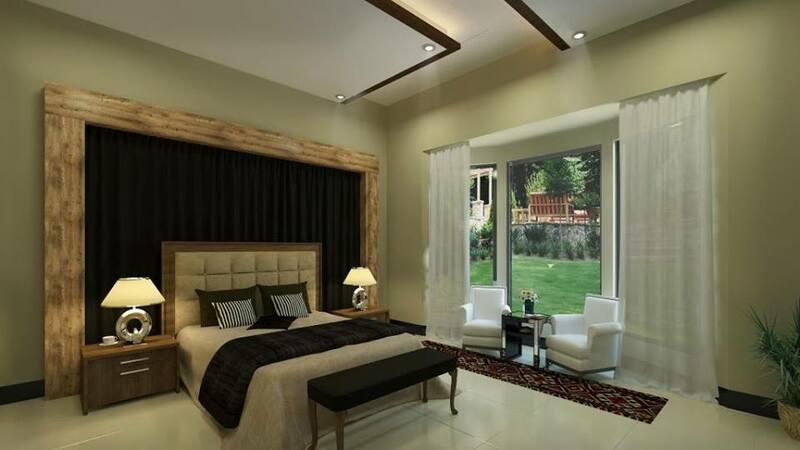 Usually, interior decorators in Lahore prefer to go with cotton or linen beddings, but you have the luxury to opt for any type of bedding that you like to sink into after a long and tiring day. A plush bedding can greatly serve the purpose, so don’t spend less here. It’s better to have two sets of plush bedding rather than filling your cabinet with sub-par bed sheets. In order to create more space in your room to attain that simple minimal look, you need to clear the mess first. Although, it’s never easy to keep your stuff to minimum, but it’s worth it to have some free space in the room where you can rest your eyes. Most of all, you’ll get some space to hang a lovely piece of art or an accessory. Once you manage to remove the clutter, it’ll become lot easier to bring in a side table, chest of drawers or anything that can cover the space by the bed to place a cup of coffee or tea. You can also use the table to place your stack of books or other reading materials. Above all, the table will help you maintain the look that you want. Lightning will also play a vital role in achieving the simple minimal design. The best option that any interior decorator in Lahore may suggest you would be fancy lamps or hanging pendants. But we at Amer Adnan will suggest you to go for the ones that are practical, soothing and probably dimmable. This includes simple table lamp, wall mounted sconces and etc. In case, two people are sharing a room then, each must get their own reading or task lightning. We hope that aforementioned tips will give you the interior design that not only meet your expectations, but creative benchmark too.